"A simple strawberry pudding with no dairy. And it only has three ingredients!" Place the strawberries and water in a blender or food processor, and blend until smooth. Pour into a small saucepan. Stir in tapioca, and let stand for 10 minutes to soften. Bring to a boil over medium heat, stirring frequently to prevent sticking. Remove from heat when thick, and pour into serving dishes. See how to make strawberry shortcake with airy buttermilk biscuits. Sorry, this was horrid. It had no taste, and I had to add sugar just to make it go down comfortably. 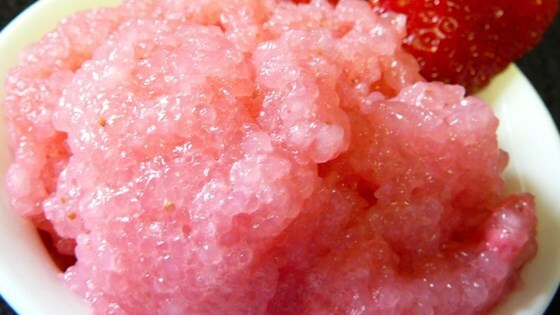 This is a non-sweet version of tapioca - no sugar added. It is not creamy like the vanilla, milk and sugar kind. Still it is good and it's something different. Every recipe is subject to the cook's opinion. I did some tweaking myself, and found it satisfactory. No flavor, not sweet enough. if you add some sugar, it makes it taste less like strawberry jam. nothing like the familiarity of vanilla tapioca though.